One of the coolest classes at CMU is the 16-861 Mobile Robot Development/16-865 Advanced Mobile Robot Development (of which I am now the TA). 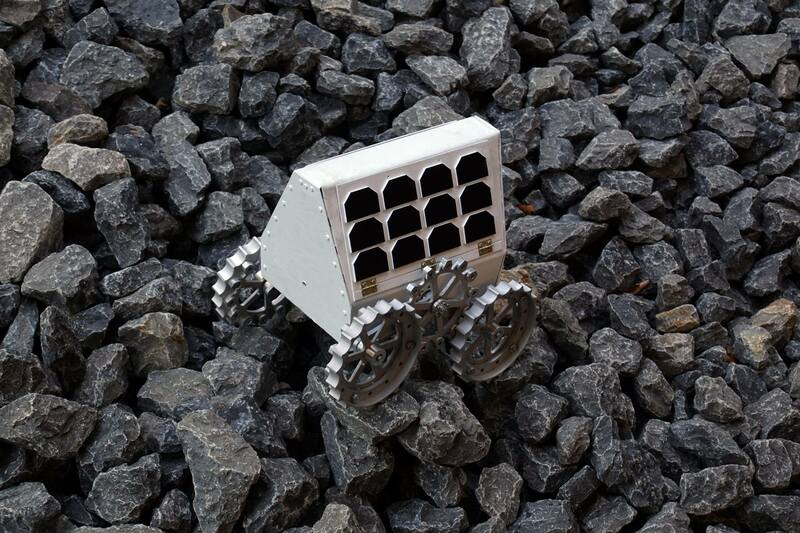 Even though CMU had formally dropped out of the competition, when I took the class, the goal was still to design a rover for the Google Lunar XPRIZE. This design also allows for mobility using only two motors as part of a skid-steer system. A suitable suspension system for this design is a body averaging system, or “rocker bogie” system that is similar to what Curiosity uses. Applied to this robot, as one side tilts up, the other side of the robot tilts down, “averaging” the position of the body. Unlike on Curiosity which has individually driven wheels, this rover only has two motors, driving two wheels each. This created an interesting design problem, how do you design a suspension where the motor is fixed, but allows for rotation around the same axis of the shaft of the motor? Cross-section of mechanism shown above. Labeled cross section of mechanism. Slightly different than what is shown above because it integrated the final CAD from other members of the team. CNC’d rocker arm for the final prototype. I developed the G-Code in Mastercam and set-up the CNC (with some help from the machinists) myself. Only broke one bit, and on the last pass, so close! This class taught me a little more about designing for space and allowed me to design and machine (and use the CNC for the first time) to build my mechanism. It was definitely cool to see the whole thing turning with the gears that someone else in the class designed and machined. It would have been very nice to continue and refine this, but another project came along, this time shooting for a 2-kg lunar rover. While this mechanism didn’t make it into the new design, I was able to use my knowledge about the entire system as the lead systems engineer, which you can read about here. Assembled final prototype in the Mars dirt simulant testbed at CMU. Generations of CMU’s rovers, from Andy, down to the midterm 2-kg design described here.